This is great for a birthday. Print photos, 1 for each year of your child's life. I did this project for a 15 year old. adhere them to mounting paper and punch a hole in the top. Order helium balloons with a ribbon attached. Attach the photo to the balloon. Place balloons over your child's bed. Makes a great surprise for them. So fun, just don’t let the little kids run through them like they did at my 21st! I love this idea!!! Would be cute to even tie a small gift to the balloon! Definitely going to use this idea! love this idea and will use this for first birthday of my son. My sister did this for her engagement, with little polaroid pictures, it looked so good! And everyone got to take one as a keepsake! This is the best post l have seen,just brilliant! They look beautiful. Parents have so much imagination now. I have some catching up to do. I am glad these are well anchored. Within the last few weeks there has been a warning about a child helping to blow one up that was leaking air and had fun but inhaled the gas that had accumulated. I think it was on this site. Thanks for sharing; this really would make for a beautiful surprise!. The balloons make the table so beautiful and festive!! 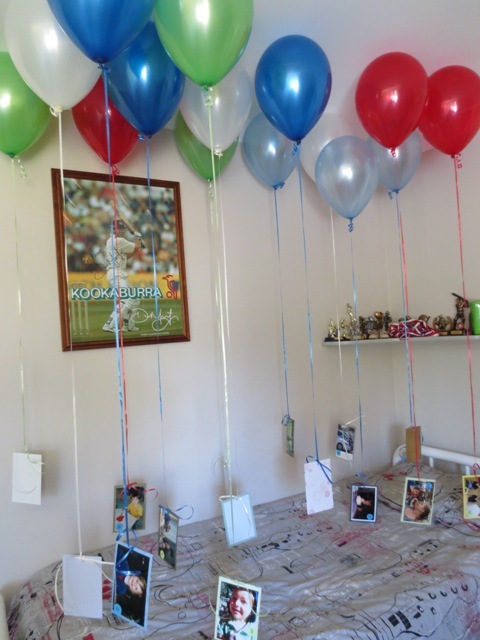 This is a lovely idea and a wonderful surprise for the birthday boy/girl.